It happens all the time, you get your camera system and excitedly begin running the cables from your DVR out to where you want the camera to mount. 20 feet short of being able to connect the camera, you suddenly find that your cable came up short. 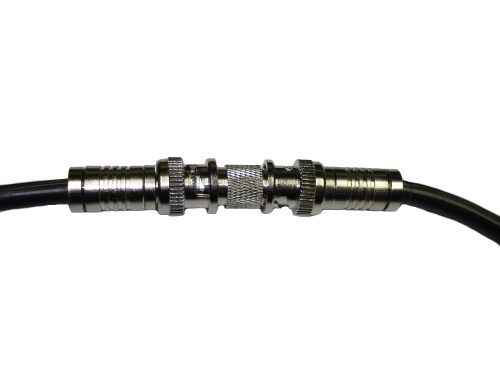 Now you are faced with No problem, we have you covered, with our BNC-S splice connector, you can connect two cctv camera cables together to give that little extra length to complete your run. Installing this BNC-S connector could not be easier. Simply place this connector right between two security camera cables that have BNC ends. CCTV security camera cables already have the BNC Male connectors on each end, so they will not plug directly into each other, that is why an adapter is required. The power connectors of these cables (when installed in the correct direction) will already connect to each other, so only the BNC end needs to be adapted. 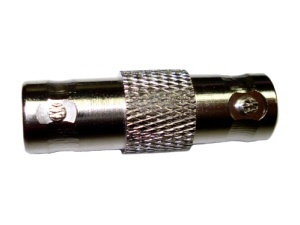 This image shows how this easy BNC connector is used to increase the length of your cctv camera cable. Every junction point in a video cable can introduce additional interference, so we recommend using high quality cctv cables, like our RG-P series heavy duty cctv cables when extending the cable to your camera.